Oppo's sub-brand Realme will be conducting the second sale of Realme 2. The device first went on sale last week and according to the company, it was received extremely well. 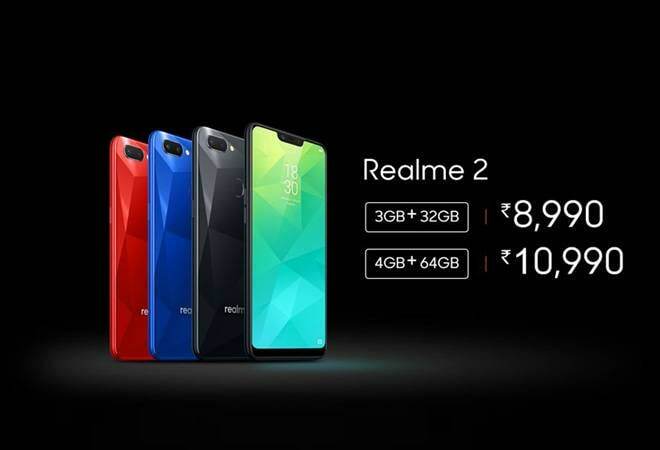 Oppo's sub-brand Realme will be conducting the second sale of Realme 2. The device first went on sale last week and according to the company, it was received extremely well. Realme claimed to have sold over 2,00,000 smartphone units in just five minutes. Later, BusinessToday.In reported that there were numerous buyers who were facing issues with the order. Many users had taken to Twitter to complain that their order was being canceled for no apparent reason. Flipkart responded by saying that the cancellation was done due to a policy of the seller. Realme, however, was prompt to respond to the complaints on the platform and promised the complainants that the issue will be taken care of. Realme 2 will be going on sale for the second time today on Flipkart at 12 pm. The device has managed to introduce first-in-segment features with the new phone at an appealing price starting at Rs 8,990. The Realme 2 will be sold in two variants one with 3GB RAM and 32GB of internal storage. This variant is selling at Rs 8,990 after a special discount of Rs 1000. The 4GB RAM and 64GB storage variant is also selling with the same discount at Rs 10,990. Flipkart is offering Rs 750 discount with the use of HDFC credit and debit cards. Users with Axis Bank Buzz Credit Card can avail a discount of 10 per cent. Reliance Jio will be giving 'instant benefits' worth Rs 4,200 and additional 120GB 4G data. Realme 2 offers a unique back design with a reflective diamond cut pattern. According to Realme the company has used 12 layers of nanoscale composite material on the phone's body. The Realme 2 also has a huge battery at 4230mAh. The device comes with a 6.2-inch display with a notch on top and 19:9 aspect ratio. The company claims a screen to body ratio of 88.8 per cent. However, Realme has used an HD+ panel which could make the display look less sharp, thanks to its massive size. The device is powered by Qualcomm's Octa-core chipset Snapdragon 450. Realme 2 comes with a dual camera setup with one 13-megapixel sensor and another 2-megapixel sensor. The secondary front facing camera comes with an 8-megapixel sensor which comes with Realme's AI Beauty 2.0 Selfie Technology. Another first in this segment will be facial recognition.